The brisk, chilly air today reminded me that winter is approaching. I can feel my muscles start to tense up just thinking about the cold weather ahead. That's when I delight in comfort items - warm, snuggly blankets, thick socks, fluffy robe, soft slippers and a good book. Yoplait Delights are kind of like your favorite comfort item. They satisfy sweet tooth cravings, luring you in with their rich, smooth texture. Yoplait Delights are luxurious yogurt parfaits that come in four appealing flavors: Chocolate Raspberry, Crème Caramel, Triple Berry Crème and my personal favorite, Lemon Torte. And, they're so delightful even my father-in-law will eat them (though I don't think he is the target audience). Thanks to My Blog Spark, we had the chance to try out this new Yoplait Yogurt. I really wanted to put the product to the test so I purchased both the Lemon Torte and Triple Berry Crème and offered them to my in-laws when they came to visit a week ago. I told them I had bought them on sale and wanted to try them out. They both selected the Lemon Torte flavor to eat. Their reaction - they loved the yogurt treat! And so did my family. My mother-in-law commented that the yogurt tasted creamy and refreshing and she made sure to study the packaging so that she could find them in the store next time she went shopping. My kids enjoyed eating the creamy white layer on top and my husband really liked the contrast of the two different layers and the consistency of the yogurt. Each Yoplait Delights serving contains only 100 calories, making it an ideal snack and the treat meets National Yogurt Association criteria for live and active culture yogurt. Just so you know though, the yogurt is sweetened with Sucralose and other sweetener, so if you're not a fan of those, you might not like the flavor. I'm kind of a yogurt snob and typically eat organic, vanilla yogurt. 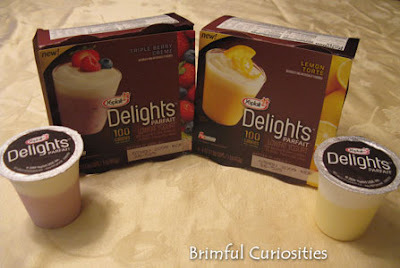 I usually can't stand the artificial taste of some yogurts, but I really did like the Lemon Torte Yoplait Delights (not so much the Triple Berry Crème, though). The word French word "parfait" means something perfect. Yoplait did a pretty good job creating an eye-pleasing, fairly delicious yogurt treat. Yoplait wants you to "Delight Your Day" and has offered to giveaway a gift pack to a Brimful Curiosities reader. The "Delight Your Day" gift pack includes, a spa mask, wrap robe and slippers and coupon for Yoplait Delights - all delightful treats for you to enjoy and relax with every day. To enter, leave a comment listing your favorite comfort snack food. • Contest ends on Monday, October 19th, 2009 at 11:59 PM CST. 1st extra entry: Visit Yoplait Delights and leave a comment with the name of the Yoplait Delights flavor that interests you the most. Wow, what a great giveaway! My favorite comfort food is ice cream. Banana pudding from Blue Bell. My favorite flavor would definitely be creme caramel. I am a caramel freak!! I even put caramel sauce on my ice cream. I am a long time follower on google reader. Love strawberries with a little whip cream . Chocolate, and I'm snacking right now. Chocolate Raspberry interests me the most. Hot soft pretzels sound really good right now. chocolate, no doubt! it can be cake, cookies, ice cream, as long as it is covered in chocolate. I would like to try the Creme Caramel. Lemon Torte appeals to me. I like Triple Berry Creme! My fave comfort food is vanilla ice cream! Chocolate Raspberry sounds like a good flavor! Favorite comfort food depends on the day. I'm loving pumpkin bread right now! My favorite comfort snack food is apple slices dipped in caramel and veg. with ranch dip. triple berry creme sounds the best to me! My favorite snack food is popcorn! I love ice cream it is the best snack. Fresh fruit is my favorite snack! The Triple Berry Creme sounds delish! The Chocolate Raspberry sounds wonderful. I would try Chocolate Raspberry first. My favorite comfort snack food is something chocolate, especially Tootsie Rolls. The Yoplait Delights flavor that interests me the most is Lemon Torte. Brownies are a wonderful comfort food.